Last year, in the very beginning of the conference season I had the good fortune to meet the lovely Abby Sasscer in Maryland. We were both speaking at that conference (Do you attend that one? I love it, such a pretty setting and nice people) and I had a chance to chat with her and then we met up again at the IHM National Conference in Fredericksburg (everyone should attend that one at least once). I so enjoyed chatting with her and meeting her husband and looking over her table. The upshot was I purchased her book Simplifying Your Domestic Church and I really love it. It lends itself to a prayerful book study beautifully and I highly recommend your doing this with some of your friends who live near you. There are many places in the book to pause, pray, meditate and journal. Since not everyone can fit this into their life or maybe you might need a little online inspiration to get started, I thought it might be fun to have a blogging book study. I will post every Friday what we will be read/doing/reflecting on in the coming week and then we can discuss. You can post here in the comments or, if it’s easier, on the Bonny Blue House Facebook page. Sharing pictures might be easier over there if you are inclined to do that. I thought that spring would be a good time to start such a discussion since the next few weeks will see many of us continuing with our Lenten spring cleaning as well as the whole switching the closets nightmare. This week I’d like to take the opportunity to introduce Abby and give you an idea of how her book will inspire you. Abby Sasscer was born and raised in the Philippines and came to the United States in 1986. She is a wife, homeschooling mother, author, speaker and founder of Project Nazareth. In 2004, Abby’s family moved to a small home in the mountains in order to practice voluntary simplicity. In 2008, she founded Project Nazareth and continues to spread the message of simple living by writing books and speaking for church groups. She has been married to Lawrence for almost 20 years and have homeschooled her three children for 16 years. Abby was kind enough to answer a few questions. 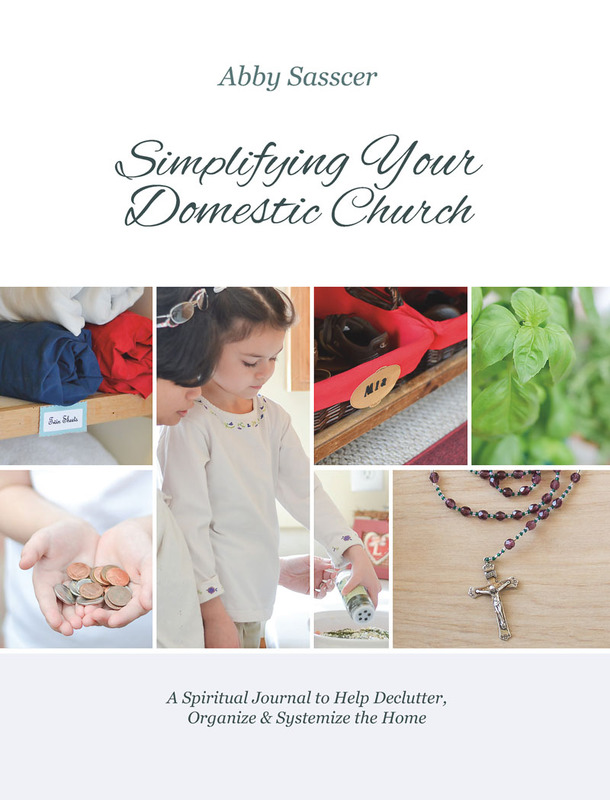 Please explain what you mean when you say simplifying your domestic church? According to the Catechism of the Catholic Church, families are “domestic churches” in which the home is the first school of the Christian life where all members learn love and prayerful worship. While we are spiritual beings, we are still very human and live in a physical world. One’s environment has the power to lead us to what is true, good and beautiful. It also has the power to distract us from our journey towards Heaven. To simplify one’s domestic church is to live a life of simplicity, both in spirit and in environment, so that members of the family can focus more on their relationship with God and their relationship with each other. You grew up in the Philippines, does the childhood you experienced there differ greatly from the typical American childhood when it comes to keeping house and accumulation? There is most definitely a distinct difference when it comes to keeping house and accumulation in the Philippines. Most homes are small and space is considered a luxury for a majority of families. This means they have to be more discerning of what needs to stay in this limited space. Also, I witnessed poverty in a very powerful way that it left such an indelible mark on my soul. Some families lived in makeshift homes as large as a bedroom or as small as a storage closet. Many of them don’t have enough for basic necessities of food, shelter and clothing. I learned at a very young age that the more you have, the more you want. And the less you have, the more thankful you are for the little that you have. You write that at one point you were discerning a vocation to the religious life, did that process help in the journey toward simplicity? Spending some time in a convent definitely helped in my journey toward simple living. The environment was very uncluttered and centered around prayer and community. The nuns still had some trinkets and such but they never took over the room. Each room gave me a feeling of indescribable freedom. The environment was such that there was more emphasis on improving my relationship with God and my fellow sisters. Having a simple environment helped me focus on living a life of virtue rather than a life of distraction. I remember sleeping in a room with nothing but a crucifix, a lamp stand and a statue of the Blessed Mother. In this room, I had the freedom to meditate, read, reflect and really listen to what my Lord needed to tell me. And with this simplicity of environment came a great joy and peace that I longed so much to parlay into my future domestic church. And no, while life is not always perfect at our little home in the hills, it’s refreshing to be able to come home to a simple environment where we can recoup and regroup from all the noise and chaos of the world. You make a great point of being meditative and prayerful in your book, why is that so important to what is often thought of as a household issue? It’s very important to look at simplifying one’s home as an opportunity to attain virtue rather than just a task or chore one has to achieve. Everytime we declutter, we practice the virtue of simplicity and holy detachment. Everytime we plan our menu and cook our meals, it becomes an opportunity to practice faithfulness. Everytime we budget, we practice prudence and wise stewardship. These seemingly mundane household tasks then becomes a means to love God and family, grow in virtue, and attain sanctity. My method is very simple – Do all things, including decluttering and simplifying, out of love for God, family, and souls. When we simplify, we have the opportunity to offer our detachment project for a higher purpose, like the conversion of poor sinners or an end in abortion. So the act of decluttering even becomes salvific in nature if united with Jesus’ sufferings on the cross. There is also a difference when it comes to the goal. With my method, the goal is not to have a perfectly simplified and empty home. Our ultimate goal is Heaven. Every single act and every single effort towards simplifying can always be offered out of love for God and souls. So even if you don’t end up with a simplified room or home right away, you are one step closer to Heaven. In the final analysis, this goal is so much more beautiful and meaningful than having a picture-perfect home. Tell us a little bit about Project Nazareth. Project Nazareth is a ministry I founded as a result of our family’s move from the city to the countryside to practice voluntary simplicity. After seven years of discernment, our family left a very comfortable life in the city and moved to a small home in the hills. All the lessons we learned during this period were parlayed into a manuscript that was to become Simplifying Your Domestic Church. Project Nazareth is a three-fold ministry. Project Mary consists of speaking engagements at different venues (parishes and conferences) in order to spread the message of simple living. Project Elizabeth Home Visitations consists of my visiting local families and helping them simplify a room in their home. Project Martha Consultations are simply free email and phone consultations if anyone has any organizational questions. What can a family gain when mom uses your study guide? My workbook includes plenty of practical tips on decluttering, organizing and systemizing one’s home. It also provides plenty of Saints’ and Scripture writings to inspire and encourage families in their journey to simplify. It includes a link for downloadable forms (such as schedule, menu, chore charts, budget sheet, etc.). So here is the link to buy the book (PDF is $9.95 and to buy the book is $15.00) and let’s try to get through the intro and chapter one by next Friday. I just heard Abbey speak at the IHM conference in Philadelphia. Her talk was wonderful. Keeping the Holy Family of Nazareth as my model and focus as I go about raising my family in the Domestic Church, is a goal I hope to strive for. I purchased her book at the conference and am looking forward to using it as Spring cleaning for my home and my soul! Isn’t Abby lovely? Such a great speaker as well, she’s an excellent addition to our panel of IHM speakers. I’m so glad you enjoyed her talk.